You can hold events and meetings under the pergola in the courtyard, in the spacious living room, or on the lawn, with the house and two-tiered stone terrace as a backdrop. Our terrace will offer you and your guests sweeping views of a Gold Country sunset. We will provide you with a list of local vendors who are familiar with the North Star House and have serviced past events on the property. This list is provided as a courtesy. 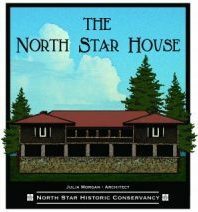 You may contact us at thenorthstarhouse@gmail.com or 530-477-7126.